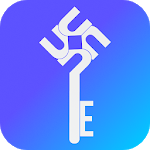 e-Utkarsh App is for all the Govt. Exam Preparation, Smart e-Books reading , Free practice test, Video lectures, All India test series etc. We are passionate about education and our motto is a quality of smart education. 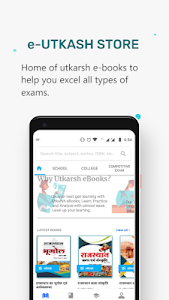 e-Utkarsh App is smart study platform that allows the best competition exam preparation for SSC, Banking, RAS, State/central level exams, Railway etc. Our App has been build on superior technology, with lucid and very intuitive user interface. •	School panel : In this panel you can get state boards smart e-books. (RBSE, CBSE, Gujarat state board, NCERT, NIOS, NISE etc.). •	College panel: In this panel you can get smart e-books for colleges. (B.sc, Engineering etc.). •	Competitive exams: In this panel you can get competitive exam books. (RAS, SSC, C.A, C.S exams, Banking, Insurance, All India test series, Entrance exams, etc.). e-Utkarsh comes with many unique features which are developed by keeping the student’s convenience in mind. 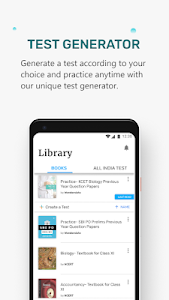 Our App is one stop solution, for your competition exam preparation, with lots of unique and amazing features. •	You can create your own test. •	Add you tube videos in the app library. •	Add web reference links. 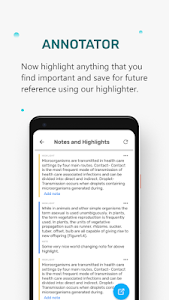 •With our smart e-books you can simply use our highlight & adding notes feature while reading on the go. •	For quick revision make your own custom flash cards. •	For each chapter, you can give online test and analyze your performance. 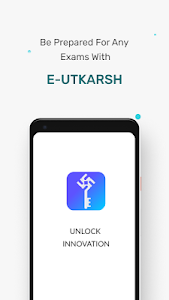 Along with these Rich Features, “ e-utkarsh App – UNLOCK INNOVATION” permits its users to take advantages of the best exam preparation app with free practice tests. These key features help competitors to reach their dream destinations. 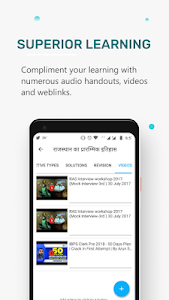 •	App is in both the languages Hindi as well as in English. •	You can buy online classes, PDF notes, online test, e-books etc. •	Get detailed explanation for every question. 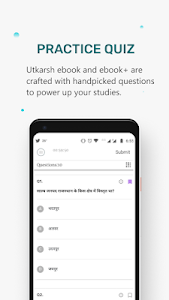 •	e-Utkarsh can be used by any student without any hassle because of its simple and easy interface. Community: Be up to date with all news and updates about any examination. Quality content: All the study content made by the experienced and expert subject teachers. We also believe hard work but in smart manner to reach the goal. Please feel free to give us your valuable feedbacks on the application, we will try our best to make it better and more useful to you as per your suggestions and your feedbacks.You can contact us at our call center number: 0291-2708400 or you can write to us at [email protected] for more details. - You can read the whole free book without adding books to the library. - The new video player is included in which the new features are added. - All India test series books. Similar to "e-Utkarsh : smart ebooks,test prep,Video lectures"